When I first learned the theme for the upcoming Graduate Student's Association Research Conference, I thought that "Curiosity" was a rather frivolous appeal for abstract submissions. This is not to downplay the epic task of getting scientists, social scientists, humanists, health professionals, and educators to not only be in the same room, but to have a productive dialogue. However, my opinion changed drastically when our history of medicine panel ran through our presentations on Monday. Fedir Razumenko opened his talk with a discussion of the life of a historical research question. Our interest in a topic has peaks and valleys he argued, we might be passionate about a question one day and be apathetic the next. The one constant that runs through the whole thing is our curiosity – that which got us interested in the first place. Anyone who has ever conducted research will recognize the cyclical nature of interest, but the staying power of curiosity might be harder to see. Graduate students, after all, are busy people and we spend our days juggling many different responsibilities. We are teaching assistants, research assistants, parents, volunteers, answerers of email, members of student government, and most of us have discovered that trimming down our sleeping time just makes life more difficult. All of which means that research time unjustly, reluctantly, and much to our supervisor's dismay, is squeezed out of our day. With this lack of daily engagement with our sources, our curiosity too is buried. In order to illustrate the power of research to reawaken our curiosity, I would like to share a quick story from my own research. My work deals with military and naval nursing in the British empire from 1763-1815. Presently, I am investigating military hospital organization, and nurse's places in them, during the Napoleonic period. My research up to last week had been clearly pointing me toward viewing the hospital as a household. Nurses, orderlies, porters, and others were regularly referred to as servants in the writings of medical officers and in official regulation books. Then last week, I came across John Hennen's view of the Napoleonic hospital: "We shall now suppose our hospitals filled, our patents laid comfortably in their beds, their diets regulated, and the whole machine in motion." Well then. That's different. To say that my interest was peeked would be an understatement. I was positively bubbling. My curiosity, while it had always been there, just needed a bit of a wake up call. Hopefully, this will encourage my fellow graduate students to remind themselves why they were curious about their topics too. 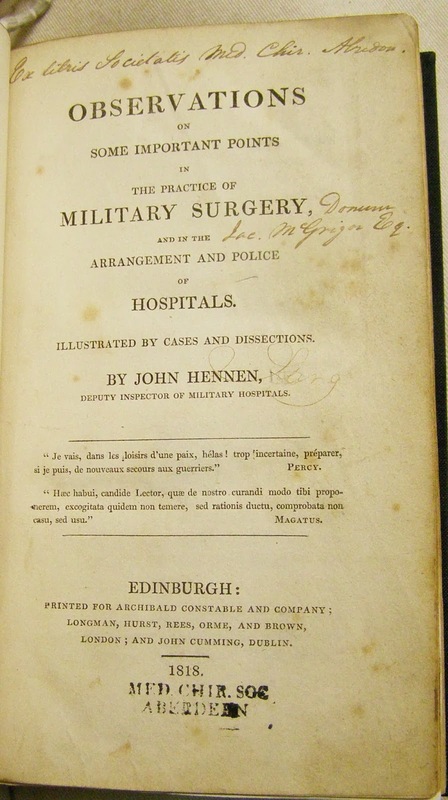 John Hennen, Observations on Some Important Points in the Practice of Military Surgery, and in the Arrangement and Police of Hospitals (Edinburgh: Archibald Constable and Company, 1818), 63.